Soukha Kachittavong Wins the $600 Mega Stack Challenge! 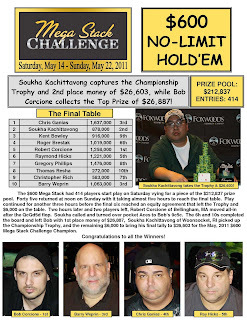 Soukha Kachittavong is officially the champion of the $600 Mega Stack Challenge event. He takes home $26,603 and the trophy! Be sure to join us tomorrow at 11am EST for the $300 Mega Stack Challenge event with a $100,000 Guaranteed prizepool. On a flop of [Qc][Qd][5d], Rob Corcione got all of his chips in the middle with [9c][5c] but ran into the [Ac][Ah] of Soukha Kachittavong. The turn came the [6h] and the river was the [Ts]. Kachittavong's aces held and Corcione was eliminated in 2nd place for $26,887. Kachittavong was ahead with his bottom pair and the [Th] on the turn and [2d] on the river did not improve Weprin. Barry Weprin was eliminated in 3rd place and takes home $22,099 per the equity chop. The board came [8c][7d][6s][Jh][3c] and Kachittavong won the pot with his pair of jacks. Ray Hicks was eliminated in 4th place and took home $20,378 per the equity chop. Rob Corcione raised to 250,000 before the flop and was called by both Ray Hicks and Roger Brestak. They all checked a flop of [Ad][Qc][6h]. The river came the [2d] and Corcione won the pot. Brestak was eliminated in 5th place and took home $14,882 after the chip chop agreement. After a flop of [Qc][6d][4d], Chris Ganias got all in with [6h][2d] against Barry Weprin's [Qd][4c]. The turn was the [9s] and the river came the [7d]. Weprin's two pair held and Chris Ganias was eliminated in 6th place for $21,238. The six remaining players have come to an agreement on a chip equity chop with $6,000 extra going to first place. The new payouts will be reflected in the payouts as each player is eliminated. The board ran out [Ah][Kc][6d][4d][7h] and Kachittavong won the pot with his pair of aces. Chris Rich was eliminated in 7th place for $7,407. $600 Mega Stack Now Streaming Live After Dinner Break! Play has resumed at the final table of the $600 Mega Stack Challenge. The average chip stack with seven players remaining is now 1,478,000. The final seven players in the $600 Mega Stack Challenge have decided to take a 40-minute dinner break. Play will resume at 7:10pm EST. The board came [8d][5s][4c][9s][2d] and Kachittavong improved to a set to win the pot. Greg Phillips was eliminated in 8th place for $5,917. Kent Bowley and Chris Ganias get all in before the flop in the biggest pot of the tournament. Bowley held [Kh][Ks] but Ganias turned up [Ad][As]. The board ran out [8s][7h][2h][Js][Td] and Bowley was sent to the rail in 9th place for $4,876. The board ran out [8d][8s][7c][2h][7d] and Brestak's tens held to win the pot. Resha was eliminated in 10th place for $3,298. We are down to the final table of the $600 Mega Stack Challenge. Here are the results for 11th-12th place. These players take home $3,298. Here are the results for 13th-16th place. These players take home $2,447. Here are the results for 16th-20th place. These players take home $1,872. Here are the results for 21st-30th place. These players take home $1,532. We are down to the final 20 players in the $600 Mega Stack Challenge. With 29 players remaining, the average chip stack is now 357,000. Here are the results for 31st-40th place. These players take home $1,404. Here are the results for 41st-45th place. These players take home $1,319. You can now watch Day 2 of the $600 Mega Stack Challenge live by clicking "Watch LIVE Video" at the top of the page. Blinds are 4,000-8,000 with a 1,000 ante. We are just moments away from the start of Day 2 of the $600 Mega Stack Challenge event. There are 45 players remaining and the average chip stack is 230,000. The blinds will be 4,000-8,000 with a 1,000 ante for another 26 minutes. We are down to 45 players in the $600 Mega Stack Challenge and all players are in the money and guaranteed at least $1,319. With only 48 players remaining and top 45 finishing in the money, the players and tournament officials in the $600 Mega Stack Challenge have decided to play one more level or until the money, whichever comes first. The average chip stack is now 215,600.